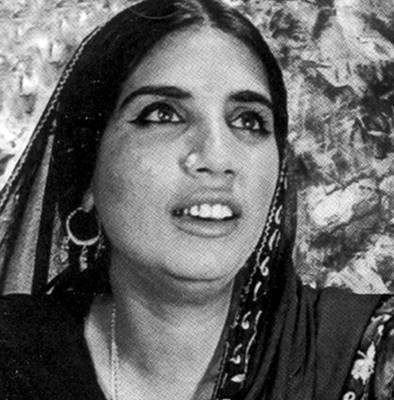 Reshma was from a Khanabadosh [nomad] tribe and was discovered by a Pakistan TV producer who recorded her song Lambi Judai at PTV. Reshma had a distinct nomad voice and had amazing natural echo which gave her songs a natural melancholy. Lambi Judai became an instant hit in late 1970s and Reshma became an overnight star. Reshma as a person was truly authentic, without any pomp and show, which endeared her to millions across Pakistan and India. In her interview with Naeem Bokhari long ago, she mentioned travelling many miles in Southern Punjab and living a nomadic life. Despite her stardom, she kept her life simple and that made her even more loveable. In 1980s, Subhaash Gai, a famous producer in India, invited her to visit India and record a remix of Lambi Judai, which featured in movie Hero. This remix version also became instant hit in India, and Reshma became a celebrity in India also.